GEMCO TURNKEY WOOD PELLET PLANT ON SALE NOW! Factory direct sale. The price is real. Total turnkey project solution. Worry free and labor free. Capacity from 1 ton per hour to 150 tons per hour. Flexible choices. Already sold to 79 countries, quality guaranteed by real customers. Why do you need to buy a pellet plant? If you have access to abundant of material: trees, logs, branches, leaves, grasses, sawdust, wood shavings, suchlike. Chances are you will ask one questions to yourself, how do I deal with the material so that I can make money. The answer is simple: make the material into pellets. But why wood pellets? Because this product is unique and promising. Since the traditional energy is limited to some extent duo to the environmental pollution issue, as a renewable energy, wood pellets are now a trending products that promoted by the government. So, you can sell wood pellets to make money. Also, wood pellets are used in different applications, first and foremost, the majority of wood pellets that produced globally are used for power generation. More and more countries are asking the traditional power plant to partially replace coal with biomass material, e.g. wood pellets. The second largest usage for wood pellets is home heating, with a pellet stove, you can warm your house in the winter to save your electricity bills. Wood pellets also have more interesting usages, for example, they are used with a pellet cooker for grill; for the farmers, wood pellets can be used as house bedding. You can even sell wood pellets as cat litter! So if you have large amount of material which can be pelletized, you definitely should consider to build you own pellet plant. But if you have only limited material, can you make pellets? Yes you can! A small pellet mill get you covered. What equipment do you need for building a pellet plant and how much do you need to pay? Like all other factories, there are some considerations you have to pay attentions: do you have enough space to build the workshop? Is the site close enough to get access to the material? Is your factory close enough to the sea port? If you have three yeses to the questions, let go on to the equipment list. a hammer mill for reducing the size of the material, as before feeding into the pellet mill, the material shall be in the size of small pieces, not a log that is 1.5 m long. a dryer for control the water content in the raw material, if you want to make wood pellets, then it is optimal to control the moisture within 10% – 15%. a ring die pellet machine for making pellets, this is the core equipment. a cooler for cool down the pellets as wood pellets that are just produced is hot. a packing machine for pack wood pellet into bags ready for sale. Additional machinery may be needed in most cased, for example, you will need a magnetic separator if the material you have is mixed with metal pieces. the amount of your material, how much pellets can the material make per hour. the capacity you want to reach. 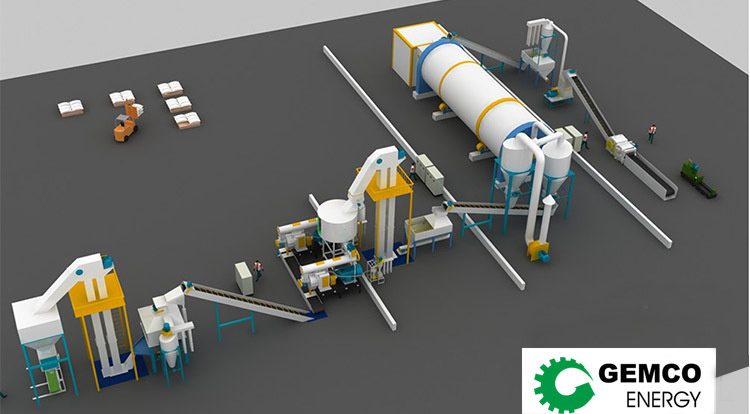 The higher capacity the pellet plant is designed with, the more pellet mills are needed. your special requirements, such as PLC control, full automatic packing system. So it is difficult to just give you a price. If you have your ideas, please contact GEMCO engineer, they will design the wood pellet plant for you and give you the best quotation for free. How are the investment return cycle and the profit of a pellet plant? Generally speaking, the profit is good if you control the 3 points: 1. you get a grant from local government; 2. you hire a professional team who knows how to make pellets; 3. you follow the latest market information and technology. For more information regarding the profit issue, please check this article for pellet plant cost and profit analysis. Why should you choose GEMCO as a partner? we have plenty of successful pellet plant projects in and out of China for your reference and visit.